Crabs are crustaceans and they live in either saltwater or freshwater environments. There are hundreds of species of crabs but among them, two are very popular commercially due to their sizes and the quality of the harvest. These are snow crabs and king crabs. These two crabs are sought after for their sweet, rich, and moist meat. This article will tell you more about each type of crab and also provide you some information on their differences. Measure 2 feet from claw to claw and weigh as much as 3 lbs. Measure 10 feet from claw to claw and weigh 10-15 lbs. The snow crab is a crustacean that belongs to the genus Chionoecetes and family Oregoniidae. It has a nearly round carapace or hard outer shell and a short rostrum or beak. Snow crabs are also known as queen crabs and are usually brown in color. It has five pairs of legs that are long and thin. They can be found in the Bering Sea, the Chukchi Sea, and the Western Atlantic Ocean. These crabs have a length of about two feet if you measure from claw to claw and can weigh as much as three pounds. Larger snow crabs are found deep in the sea while smaller ones are found in shallower waters. Male snow crabs are bigger than the females and are easily recognizable by the size of their claws. Snow crabs are known to be scavengers. Cannibalism is also common among the female snow crabs. Snow crabs are often harvested and are a favorite of many for their delicate yet rich and fibrous meat texture. The snow crab’s meat is sweet and is commonly used in sushi. The king crab belongs to the genus Paralithodes and family Lithodidae. It has a hard and spiky shell or exoskeleton. King crabs are also known as stone crabs. King crabs have three pairs of legs, a pincher claw, and a crusher claw. They are usually found in the Southern Hemisphere in warmer waters. An exception to this, though, is the Alaskan king crab or red king crab which is found in the near-freezing deep waters of the Bering Sea. Among all the species of king crabs, the red king crab is the largest and most prized species of all. They can measure as long as ten feet from claw to claw and weigh around fifteen pounds. King crabs are the most commonly harvested crabs due to their population, large size, and the taste of their meat. The king crab has white meat with red edges and is very moist and rich. The king crab is a delicacy that is sought after in different parts of the world, making it very expensive. 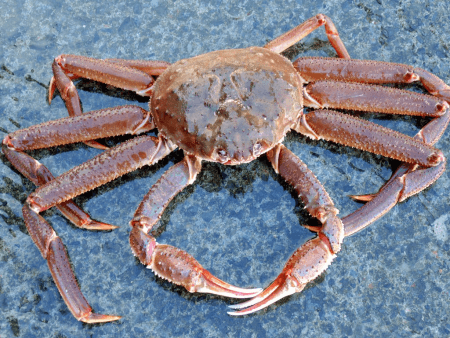 What is the difference between a snow crab and a king crab? 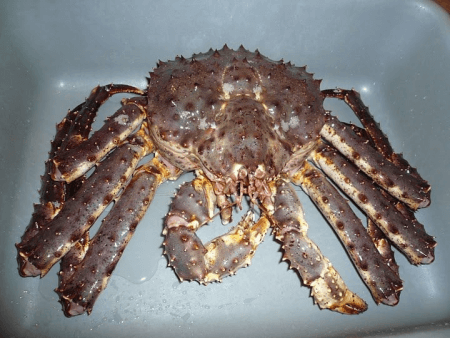 A snow crab is generally smaller than the king crab. The snow crab is native to the Northwest Atlantic and the North Pacific oceans while many of the king crabs are found in the Southern Hemisphere except for some that are found in the freezing waters of Alaska. Characteristics of snow crabs are their long, thin legs compared to the king crabs which have prominent spiky structures on their exoskeleton. In terms of size and weight, the snow crab measures 2 feet from claw to claw and weighs as much as 3 lbs. The king crab, on the other hand, measures 10 feet from claw to claw and weighs 10-15 lbs.